After taking a year off, we are excited to announce that the CSA is back. 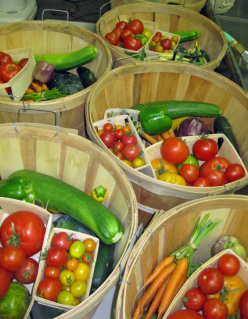 If you would like to receive a basket of Certified Naturally Grown fresh vegetables each week throughout 16 weeks of the growing season, we would love for you to join us. 1. Friday afternoon between 5:00 and 7:00 pm at the farm. All of the information on dates and pricing can be found on our CSA updates page. If you would like us to send you more information and a contract form, please use the form below to let us know. We offer Certified Naturally Grown Vegetables and Fruit. We also have Free Range Eggs and Pastured Poultry. Naturally, locally, and sustainably grown in Janesville, California.